Rome in Africa: Africa in Rome – Reuse, recycle and renew. Anyone who has ever been to, or near, a Roman site anywhere in the world, will have noticed that there is always a certain level of recycling in evidence. 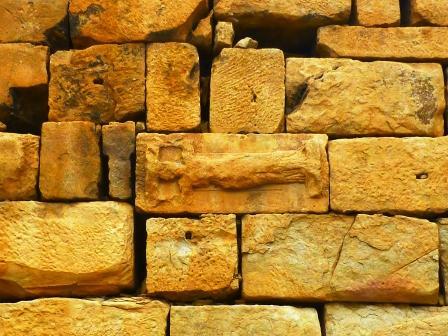 Sometimes pre-Roman material is recycled in the construction of Roman sites. Sometimes material is reused and recycled during the period of Roman occupation. Frequently Roman sites are used as quarries, with material taken to build later structures (have a look at the Wallquest project, mapping material taken from Hadrian’s Wall (and other places) and used to build churches in the Tyne Valley). The particular history of a region can determine how, and why, material is reused. Sometimes some external threat necessitates the reorganisation of space within a city. Sometimes a changing economic situation results in old structures being dismantled and new ones built. Depopulation, war, famine, negative factors, can result in changes to the urban landscape, but equally, these can be the result of improvements in the fortunes of a city. At a number of North African sites we can see this kind of structure. These are fortresses built by the Byzantines, often using recycled material from the Roman towns and cities on, or in which they sit. 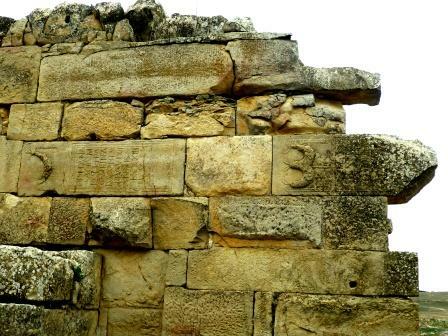 These fortresses were often thrown up very quickly in response to the various crises of the 2nd and 3rd centuries. 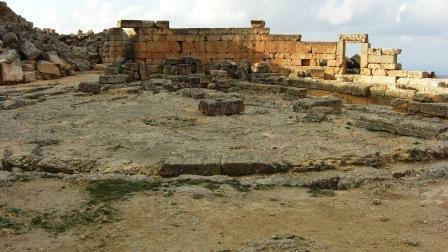 This one at Madauros, was constructed in a hurry in response to the threat from the Numidian tribes attacking the town. Although the building itself is sound, the stonework is a bit hotch-potch, with a whole variety of stone sizes used in one wall. When you’re in a hurry any decent piece of stone will do. All of this stonework has been taken from buildings in the pre-existing town but some of the reused pieces are pretty obvious. Some are slightly more subtle, but they’re there if you look. 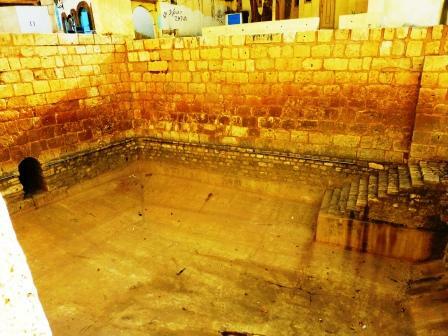 In Gafsa, Tunisia, there are two pools at the corner of the casbah, fed by nearby hot springs. I understand that changes to the oasis irrigation methods have resulted in the water supply to the pools being cut off. When I visited, they were empty, but when they were full the local boys had great fun jumping and diving from the steps. 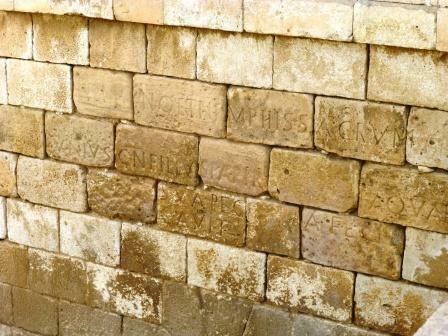 They’re constructed from good Roman ashlar blocks, but these are certainly reused, as a closer examination reveals that some of the blocks are a little awry. 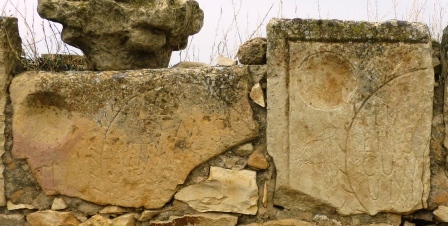 These are fragments of inscriptions which are, in themselves, important as the fragments reveal the existence, somewhere in the town, of a nymphaeum dedicated to Neptune, and that by the time of Hadrian, Gafsa (Roman Capsa) was no longer a civitas but became a municipium in Trajan’s reign. 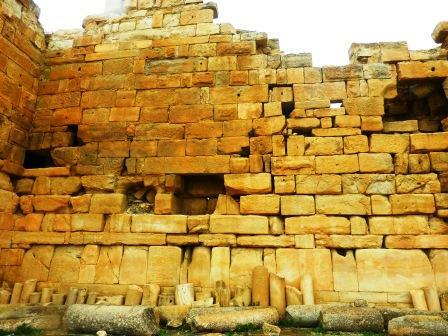 As well as Roman building material being reused in antiquity, sometimes whole buildings are reused, their function changed to suit the changing times or, perhaps, new populations. 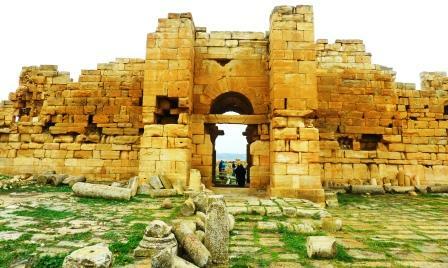 At Tipasa, on the Algerian coast, Roman homes were converted in the Byzantine period, into shops and storehouses. 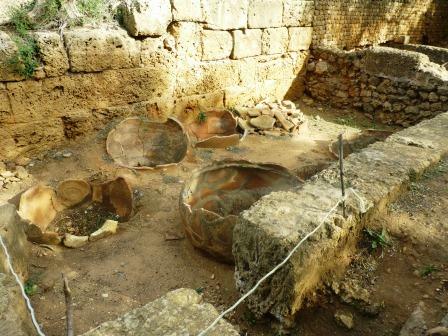 These large amphorae sunk into the floor of the old houses would have held commodities such as olive oil, salted fish or grain. This is the theatre-amphitheatre at the Temple of Apollo in Cyrene, Libya. This was originally a Hellenistic theatre with a semi-circular orkestra (dancing floor), but was altered in the Roman period into an oval amphitheatre**. This actually took some doing because the site is on the edge of an escarpment. 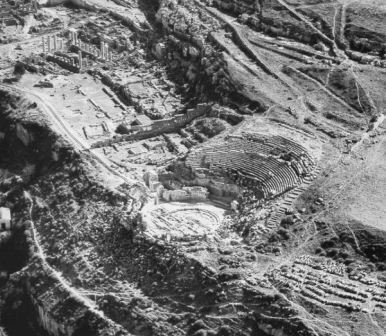 This is an aerial photograph showing the site, in which the foundations of the Greek theatre building (scaene) and orkestra are clearly visible, running across the later oval-shaped amphitheatre. 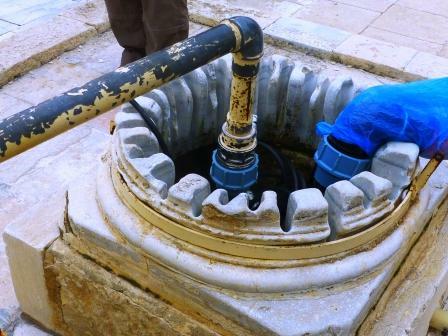 This, slightly later, site adaptation can be seen in the Village of Bled el-Haddar in the oasis of Tozeur in Tunisia. 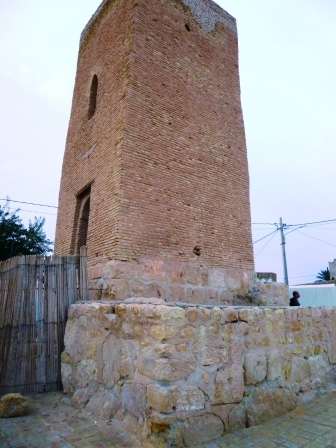 The village itself is pretty unremarkable, sited in part of the palmery a short walk from Tozeur town centre, but the one feature that might interest us here is the minaret of the small local mosque. It’s built on the foundations of a Roman tower. I’ve no idea what the original structure on the site might have been. Perhaps a watch tower, or even a tower tomb, but there isn’t much left of it. Still, there’s enough to be able to spot the entirely different stonework involved and this represents the scant remains of the Roman town of Tusuros. 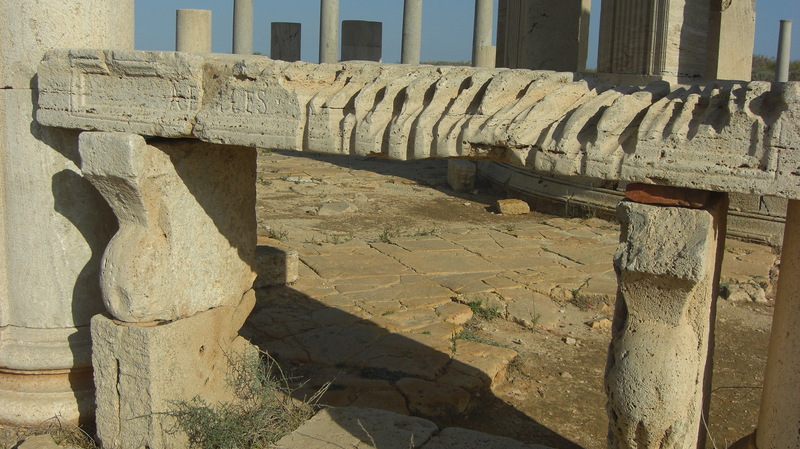 Many of North Africa’s modern cities were established on or near the sites of ancient cities and reused Roman material also crops up around these cities. Ancient material incorporated into the fabric of modern life. All over cites, you can see Roman columns. 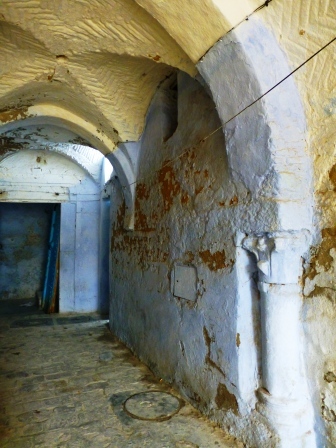 They’re everywhere around the casbahs of Kairouan and Tunis. Some have even been repainted. 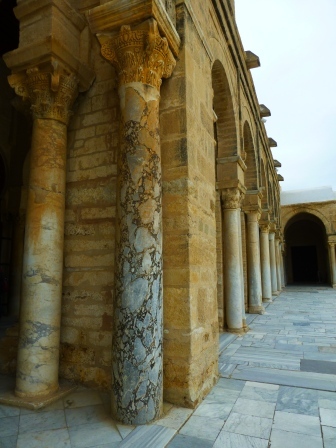 At Kairouan in Tunisia, established in the 7th century, one of the country’s most important Muslim sites, the Great Mosque of Sidi-Uqba has been constructed using more than 500 columns brought from Roman sites including Sbeïtla, Hadrumetum and Chemtou and from as far away as Carthage. 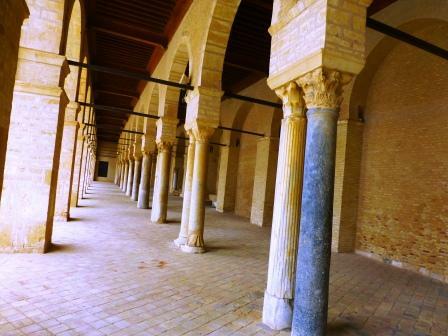 Going round the courtyard, you can see columns of different heights, made from a whole variety of materials and with different column capitals. 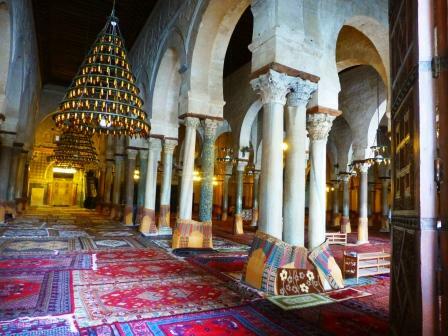 Inside the prayer hall are more. Note all the different heights. 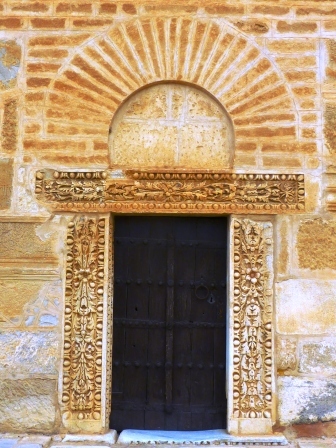 Other recycled Roman elements in the mosque include these lintels, used to create an attractive door surround. 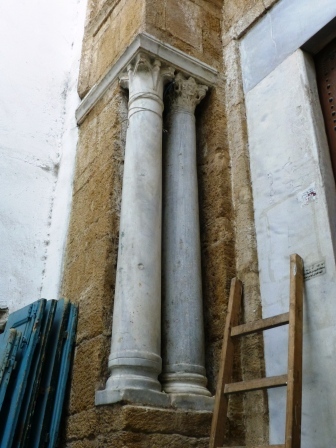 And this large column base, which has been reused as a well-head. The pipes and pumps are modern, of course, but the grooves around the column base are wear evidence of the ropes used to haul up buckets in earlier times. 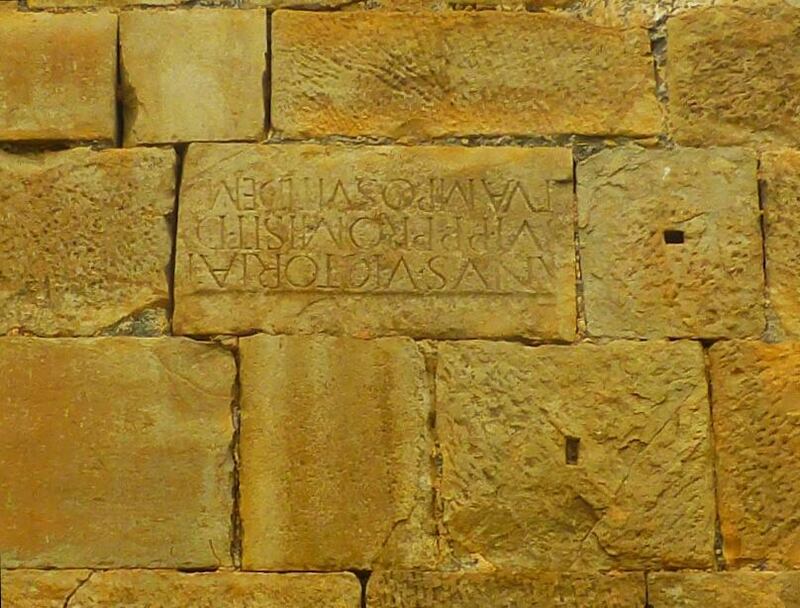 Similarly, in the macellum at Lepcis Magna, Libya, this market table shows clear signs of use as a well cover. The deep grooves are, again, signs of wear made by the rope pulling over the stone. 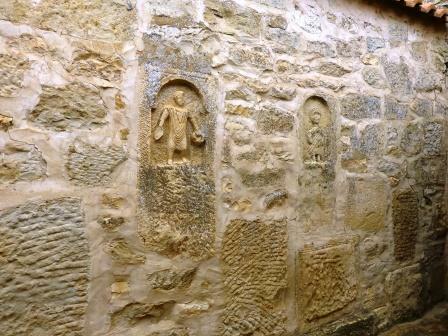 At Madauros there is also some quite ‘interesting’, and considerably later reuse of Roman stonework. 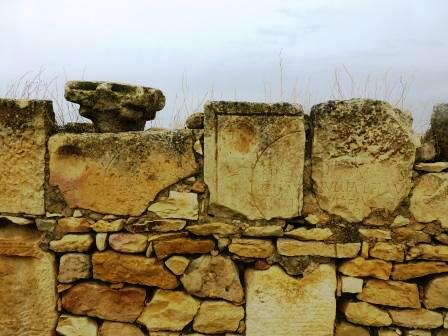 Many of the grave markers recovered by French archaeologists excavating the site in the 1930s were used to embellish the wall running alongside the main street. While this does allow a good view of the stones, that view is pretty distorted. For one thing, not all of the stones would have originally been set in an upright position. 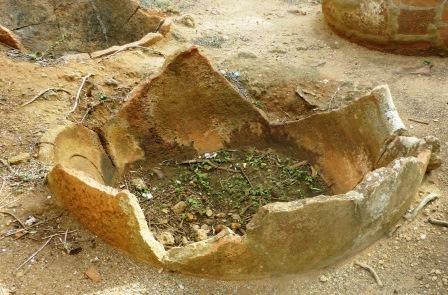 The second and third from the left (eg) would have been laid flat on the ground, as they both have bowl-shaped indentations designed to receive libations. 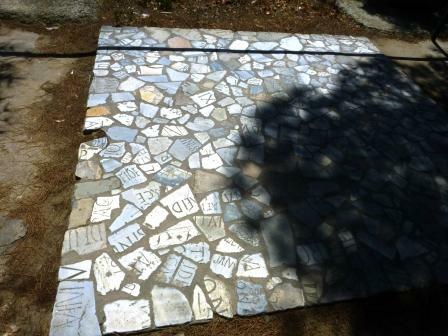 This practice of reuse is visible around the site, as the wall of what will be the new on-site museum also contains reused Roman grave stones and building blocks. Someone also went further in their recycling zeal as a careful examination of the grave markers reveals that while they may all be Roman stonework, they weren’t all originally grave markers. This one (above) is a column base which has been upturned and crudely inscribed in order to give it the appearance of a Roman grave marker. 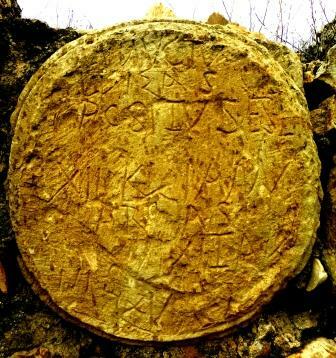 Whether this was done in antiquity or (much) later, I don’t know (I suspect the latter) but either way, how odd! We often frown upon people who treat ancient sites as quarries and builders merchants, but at many sites and in many areas this reuse then forms a revealing part of the continuing story of those sites. 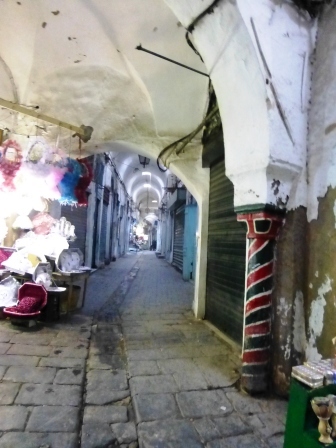 * This area of pavement can be seen at Carthage, Tunisia. It’s been made from little pieces of broken inscriptions. ** There were actually several phases of alteration to the theatre-amphitheatre at Cyrene, chiefly in the construction of the scaenae and the seating (cavea). 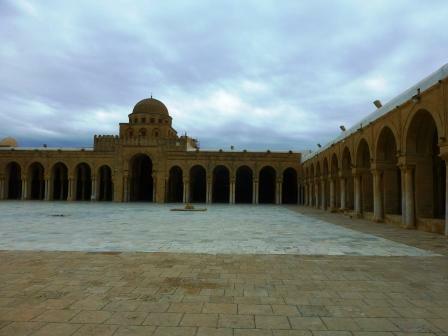 This entry was posted in Algeria, Archaeology, Libya, Museums and Exhibitions, Romans, Tunisia and tagged Africa Proconsularis, Algeria, amphitheatre, Archaeology, Libya, Museum Blogger, Tunisia. Bookmark the permalink. Great stuff. As you have done more than once, this is a topic I was planning on addressing but you have beaten me to it! Oh, advanced warning….we may be passing through London on May 9/10 and might require entertaining. No clubs though, at our age the hearing is dodgy enough that your musical preferences would likely render us entirely deaf! Hey Lord T, just because I’ve looked at this, doesn’t mean that you can’t. As you’re going to be in the Roman Fatherland later in the year, maybe that’s a perfect opportunity to so some comparisons between the centre and the outer provinces. Hmmm. Hooray, if you are going to be in the smoke we absolutely must meet up. I’ll PM you.